If you’re looking to make the most of the sunny weather, you should definitely check out Bloom festival in the Phoenix Park, Dublin. Now in its tenth year, Bloom has grown from a humble gardening show to a fully fledged food, drink and horticulture festival. We popped along today to find out first hand what it’s all about and recommend some of the best bits we think you should check out this bank holiday weekend. Gardens & Horticulture – this is the epicentre of the festival with over 23 gardens designed by some of Ireland’s top garden designers. 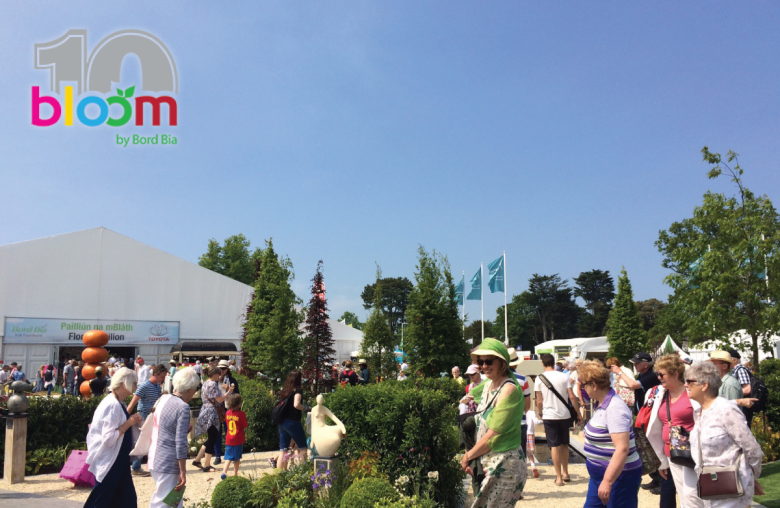 From mini postcard gardens to sculpture installations, nurseries and larger show gardens, Bloom “offers visitors a taste of the latest planting and design trends in Ireland which can be recreated in back gardens around the country”. You can also get involved with the GIY (Grow It Yourself) section encouraging visitors to learn how to plant and grown their own food at home. We recommend: the Garden of Sculptures. Beautiful outdoor gallery showcasing some of the best Irish sculptors and artists. Oh and of course the flower & plant gardens.. but that’s an obvious one! Food & Drinks – the Food Village and Market boasts some of the best produce available in Ireland, and visitors can discover first hand Ireland’s flourishing fruit and veg industry. You can also taste and purchase a wide range of locally produced food and drink to take home with you – cheese, chocolates, craft beer (all the good stuff). Too hungry to wait? Then treat yourself to a beautiful spread from the Bloom restaurant or Seafood bar, or relax with a cappuccino at the café. There’s also plenty of smaller food and drink vendors dotted around the place for you to grab something and go lie in the sun. Perfect! We recommend: de Mad Food Co.‘s Vegan Chorizo Sizzlers & McGargle’s Francis’ Big Bangin’ IPA. Entertainment – if the gardens and food markets don’t keep you busy, Bloom has even more to entertain you. Live music, fashion shows, talks, cooking demonstrations – the list goes on. However make sure you check out the stage schedule so you don’t miss anything as times change throughout the weekend. Just click here to view the time table. We recommend: the Quality Kitchen Stage to see some live cooking demonstrations and the Banter Stage to chill out and listen to some great discussions with a few familiar faces. Family Fun/Kids – now while everything looked fantastically fun to play with, we felt we were a little too old to get involved with some of these sections. However we did have a look around, got very jealous of the kids and I even got myself a teddy bear temporary tattoo (don’t tell my mum!). We recommend: the “Fun On The Farm” section in the Kids Zone. Lots to play with and even a few chickens to say hi to! All in all we had a great day out at the festival and really recommend it. Whether you’re heading in on your own, as a couple or with the family, there’s definitely something to suit everyone here. Just don’t forget the suncream!